In this article, we’ll be discussing all of the equipment you’ll need for your home studio in 2019. As home studio creation has become more popular, companies have woken up to this trend and have thus created home recording studio equipment packages, which are made up of all the equipment you’ll need to get started recording in your home environment. These packages are particularly good because they combine all of the equipment that you’ll need to start, as we know that some beginners unknowingly purchase equipment that they’ll never use, it’s a blessing to have a package put together by experienced recording experts, so you can rest assured of what you’re purchasing. Condenser Microphone – This is a microphone which consists of a thin membrane/diaphragm in close proximity to a solid metal plate. The membrane is made of a material that is conductive, usually Gold or in older condenser microphones it is made from tin foil. As sound waves hit the metal diaphragm, it moves back and forth, the distance between the diaphragm and metal plate obviously changes, hence changing the capacitance… Ultimately this changes the sound waves to electrical signals. Due to the way in which Condenser Microphones are built, they provide a more detailed capture of an instrument’s natural frequency response. Hence, because of this, they are more popularly used for the studio recording of vocals, guitar and other instruments such as piano, etc. Audio Interface – An audio interface is a piece of equipment that allows users to plug in instruments (usually analog, although some come with MIDI connectivity) so that they can be recorded in the Digital Audio Workstation (I.E the program you are using to record, this can be such popular tools such as Pro Tools, Logic Pro, Ableton, etc). Audio interfaces come in a range of different size inputs/outputs, with larger I/O interfaces being more suited to live band recordings, and small I/O interfaces being suited to individual instrument recording on a smaller scale. Although have no doubt, a smaller interface does not necessarily have cheaper electronics, but rather fewer electronics due to the lower number of inputs/outputs. XLR Lead – An XLR lead is used to connect a microphone to the audio interface, to allow for recording to happen. Make note, if you’re looking to record guitar, you could mic up the guitar’s amplifier, or you could purchase an XLR – 1/4″ Jack lead, which would allow you to DI (Direct Input) the guitar into the audio interface… This is useful if you would prefer to edit the signal digitally as opposed to the former recording setup. Headphones – Headphones are used to help monitor your recordings (in real-time) and listen back to entire mixes. Firstly, as a musician is recording a take, he/she will need to know exactly when to come in, the tempo and other Q’s… This provides through the headphones as either a Click-Track or Track of the recording so far, so instruments can be layered on top. Additionally, once all the recording is complete, you’ll need to mix and master the song, and doing it on headphones is the best way to do this effectively. This is because it provides clarity in comparison to playing the song through speakers… Although make note, before releasing a song, try to test its sound through as many speakers and headphones as possible… After all, not everyone will be listening through studio-quality headphones. 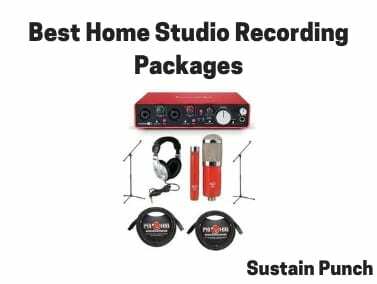 Ok, so before we go into depth about the best home recording studio bundle, it’s important to note that we try to accommodate for every visitor’s requirements, whether or not that is budget, the number of inputs/outputs, brand, connectivity, etc. Therefore although all of the packages will feature most of the equipment that we’ve mentioned above, there will be slight variations. 2 XLR/1/4″ Jack Inputs for singular or simultaneous recording. 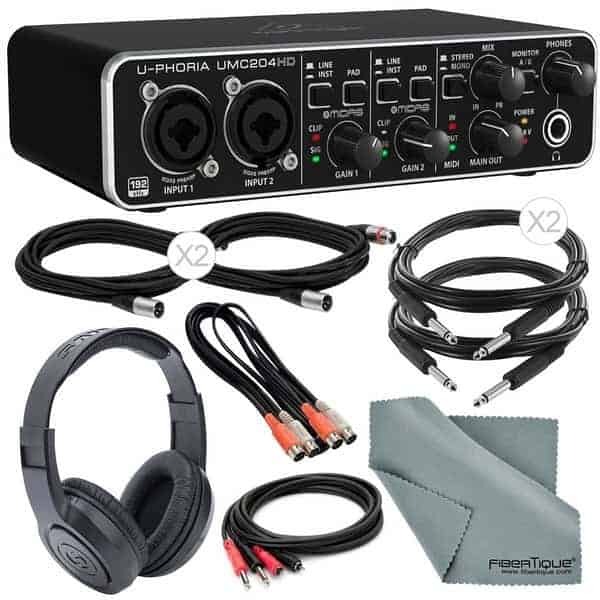 The Behringer U-Phoria UMC204HD Audio Interface bundle is a great home recording studio kit for the price. The audio interface provides fantastic conversion and sample rates, and with pre-amps designed and engineered by Midas, it simply provides ultra-high quality sound. Who is this home recording studio package ideal for? This kit is ideal for those on a budget, although make no mistake, this interface provides high-quality sound recording. With two inputs, this is targeted more towards the musician looking to record instruments sequentially as opposed to simultaneously… Although it can record two inputs simultaneously, but no more. 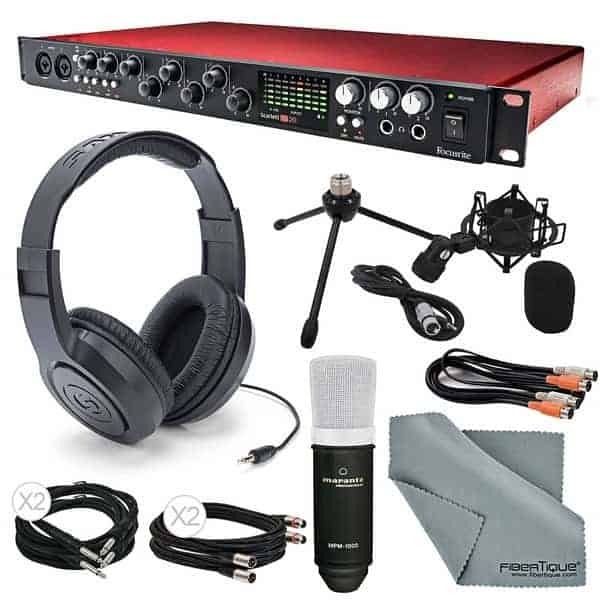 This particular package (basic bundle) comes with the audio interface, XLR leads, TRS leads, headphones and cloth; Additionally, you will need to purchase a microphone, microphone stand and stand adapter. 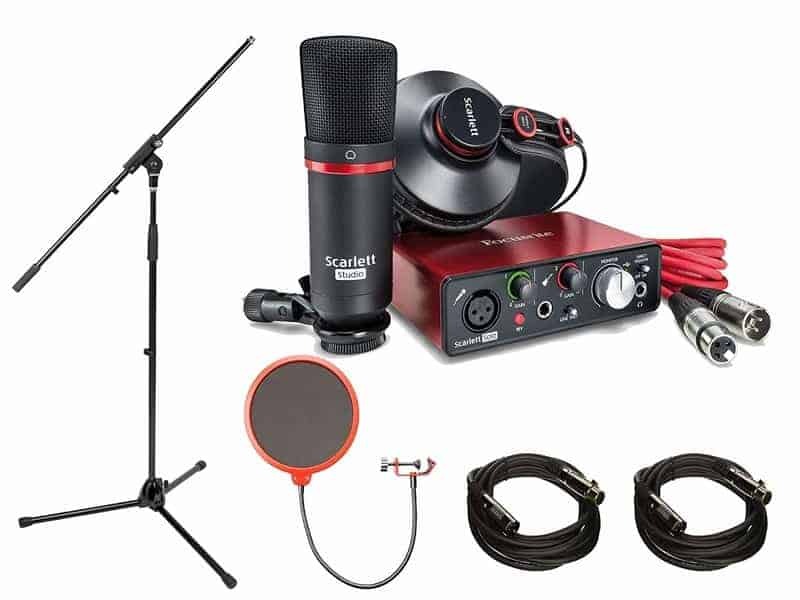 This particular package (deluxe bundle) comes with the audio interface, XLR leads, TRS leads, MIDI leads, RCA leads, Samson SR350 stereo headphones and cloth; Additionally, you will need to purchase a microphone, microphone stand and stand adapter. 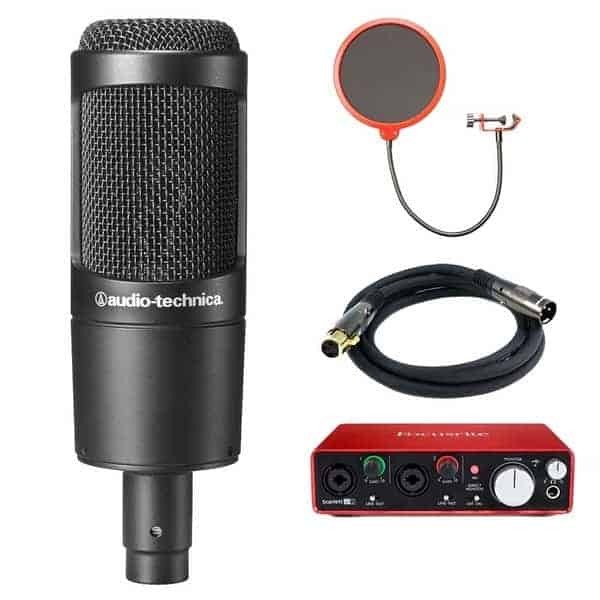 This particular package (platinum bundle) comes with the audio interface, XLR leads, TRS leads, MIDI leads, RCA leads, headphones and cloth; Additionally, although this package comes with a small microphone stand (more of a stand for podcasters), you will need to purchase a microphone stand. What does the home recording studio package contain? Class leading conversion & sample rates up to 192kHz/24 bit. 2 XLR (Microphone) Inputs / 2 Line (Guitar) Inputs for singular or simultaneous recording. The Focusrite Solo (2nd Gen) audio interface & home recording studio bundle is an Amazon Best Seller for a reason, not only do you get an interface providing the lowest latency of any other interface on the market, but you also get a great microphone and good quality headphones. Looking into the specifications of this audio interface and the accompanying equipment, it’s clear why it’s so popular, especially considering it’s price. Someone who’s looking for a reliable interface, offering ultra-low latency for under $200. This interface provides 1 XLR input and 1 TRS (line) input, so that may be a limiting factor for some who want 2 XLR inputs for some kind of live recording, but for others (singer with a guitar), this won’t be a problem. Also, if you’re just looking at doing sequential instrument recording, this is an ideal bundle. 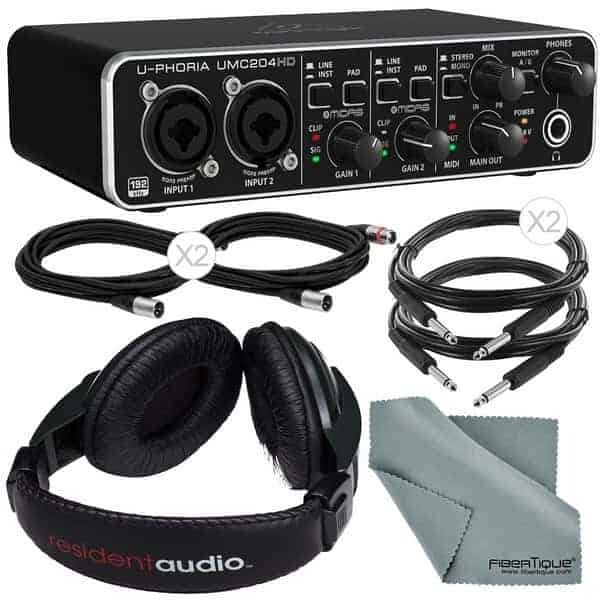 This particular package comes with the audio interface, XLR lead, headphones and a condenser microphone. 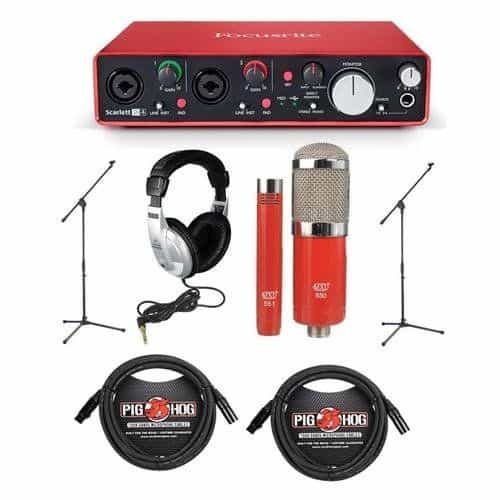 The only additional elements you will need is a microphone stand and a 1/4″ jack lead (for instruments such as guitar, bass, etc), if you don’t have these additional elements, the next Focusrite Scarlett Solo bundle package also contains a microphone stand. The Focusrite Solo (2nd Gen) audio interface & home studio recording bundle is an Amazon Best Seller for a reason, not only do you get an interface providing the lowest latency of any other interface on the market, but you also get a great microphone and good quality headphones. 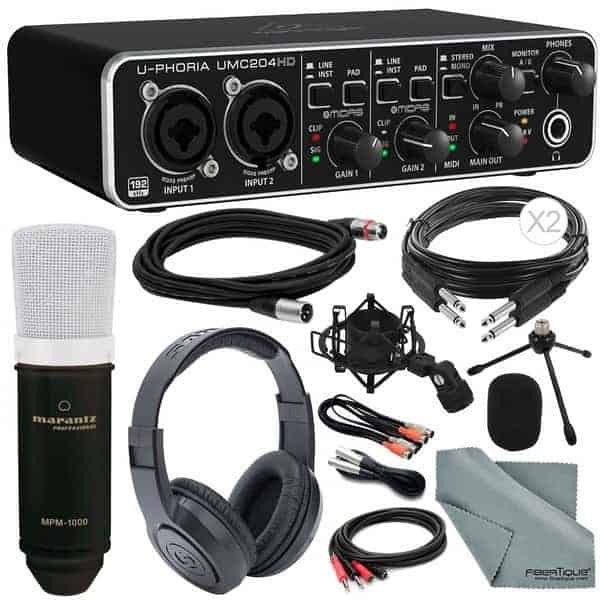 This particular package comes with the audio interface, XLR lead, 2 Gold Plated XLR leads, headphones, a condenser microphone and a microphone stand. The only additional elements you will need is a 1/4″ jack lead (for instruments such as guitar, bass, etc). 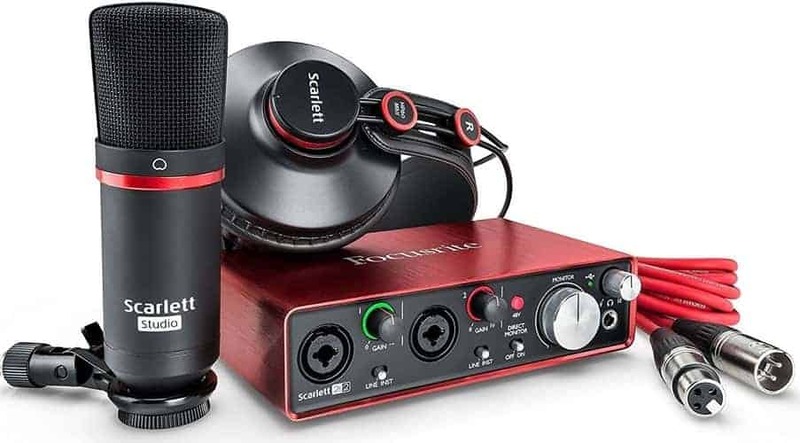 Before talking about the features or specifications, this Scarlett 2i2 is very similar to the Scarlett Solo, except it has 2 XLR/TRS inputs, as opposed to the Solo’s 1 XLR input and 1 TRS input… Making it more ideal for simultaneous recording and micing up an instrument in 2 ways. Ok, so we previously mentioned the Scarlett Solo audio interface bundle, which is certainly a good choice, but where does the Scarlett 2i2 outperform its little brother, well it provides 2 XLR/TRS inputs, as opposed to the Solo’s 1 XLR, 1 TRS input. 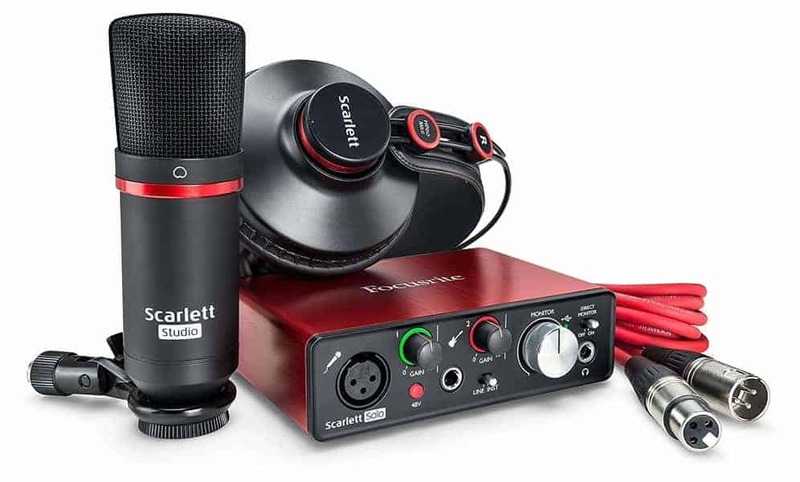 Therefore if you require at least 2 XLR inputs for simultaneous track recording, the Scarlett 2i2 is your winner. Not only this, but for the equivalent package, the Scarlett 2i2 is only $50 more than the Scarlett Solo. This particular package comes with the audio interface, XLR lead, headphones and an Audio Technica AT2020 condenser microphone. Going more into depth about the AT2020, this is a Cardioid patterned condenser microphone and has been on the market for over 15 years, now you may be wondering why people still purchase it, and that’s simply because it sounds awesome, and at under $100, it’s a fantastic product. Not only that, it has a 4.5* average on Amazon from over 500+ reviews. Before talking about the features or specifications, this Scarlett 2i4 is very similar to the Scarlett 212, except it has 2 additional line outputs, and 2 additional balanced outputs… Not only does this make it an ideal, high-quality device for recording, but also live performance. The Focusrite Scarlett 2i4 is ideal for the musician/sound engineer who’s looking for more outputs. It provides 2 balanced outputs, but also offers 4 RCS outputs (which the Scarlett 2i2 does not provide)…. Therefore if those additional outputs are important to you, this is the audio interface for you. Otherwise, there are two options, you can look for less outputs (take a look at the previous audio interface bundle in the article, the Scarlett 2i2), or more outputs (take a look at the next audio interface bundle in the article, the Scarlett 18i20). This interface bundle has the most inputs and outputs out of any interface we’ve featured on the list, making it suitable for recording live band sessions and micing up multiple instruments simultaneously. As for the sound quality, well this interface is known for providing high-quality recordings, but we’ve featured a video demonstration below so that you can see for yourself.